More than 2 years ago, SwiftKey decided to take its paid keyboard app and make it free. The alternate revenue stream proposed was a theme store for different keyboard looks where some of the options would be paid. That has been going on since then, but it changes today. 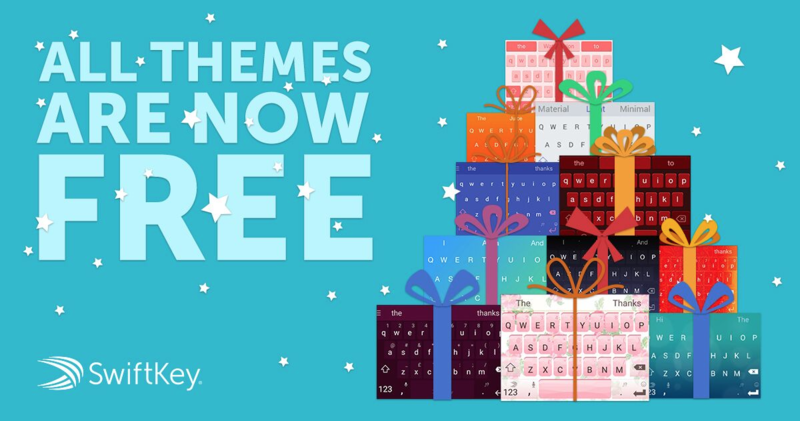 Now, all SwiftKey themes are free. Premium themes, paid packs, all 100+ of them. Free. Not a dime required. You can head over to the SwiftKey Store inside your app now to see that everything is marked as free and choose a few themes to download or just grab all the packs. There's even a new Vivid pack that includes a lot of bright colors. The change affects both Android and iOS, and SwiftKey hasn't mentioned any replacement monetization plan. Maybe now that the company is acquired by Microsoft, it doesn't need to nickel and dime its users for every theme they want to install. That's the optimistic outlook. The pessimistic one would be to have doubts of monetization based on user-generated data or consider an upcoming abandonment of the app altogether while the team focuses on other Microsoft projects. That's pure conjecture, though. For now, if you're a SwiftKey user, enjoy your free themes. And if you already paid for the app then some premium themes, you can whine about how others now get all of it without paying a cent, but I'm certain you got your money's worth while you were using the keyboard all this time. I hear it's great, but I'm too tied to Google Keyboard to even consider an alternative.